The following is a list of Viceroys of New Spain. In addition to viceroys, the following lists the highest Spanish governors of the colony of New Spain, before the appointment of the first viceroy or when the office of viceroy was vacant. Most of these individuals exercised most or all of the functions of viceroy, usually on an interim basis. This office covered the territories that were discovered by Christopher Columbus. This office covered the territories that were claimed by Hernán Cortés. The office covered the territories that were under the control of the Governor of the Indies after 1524. 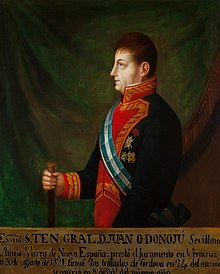 The first Viceroy of New Spain was appointed in 1535 to consolidate the offices of the Governor of the Indies and the Governor of New Spain into a single office. from 1 November to 3 November 1624. Payo Enríquez de Rivera Manrique, O.S.A. From 1700–1724, Philip V of Spain was the king; then from 1724–1746. Louis I only reigned in 1724.